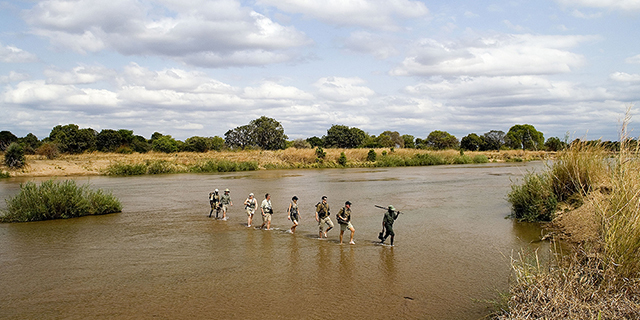 For more than 25 years, Robin Pope has been living and conducting safaris in the beautiful Luangwa Valley, and there is nothing for which he is more famous than his walking safaris. The classic Robin Pope walking safari is the 7 night Mobile Walking Safari, incorporating Nkwali Camp, three different mobile tented camps, and Tena Tena Camp; the safari accommodates a maximum of 6 guests. (The itinerary below contains links to the properties described; by clicking on these links, you will open a new page in your browser. To return to this page, simply close the new page). Guests arrive at Mfuwe airport, where they are met and transferred to Nkwali Camp (1 hour), overlooking a wide bend in the Luangwa River. Overnight on a fully inclusive basis. Nkwali accommodates a maximum of twelve guests in six cool and spacious A-frame chalets, constructed of woven bamboo and thatch. Each luxurious chalet has its own enormous open-air en suite bathroom constructed primarily of molded clay. Nkwali has easy access to the game-rich Mfuwe Sector of the National Park, via bridge and pontoon, and activities focus on the abundance of wildlife, with game-drives and night-drives in open safari vehicle being the mainstay. After an early breakfast, head north to the very remote northern section of the South Luangwa National Park, from where the walking safari sets out along the course of the Mupamadzi River. The safari covers around 6 miles per day, taking time to observe the animals and birds, and absorb the magic of Africa. Arrive in camp for an early lunch around midday. A short walk in the afternoon around the camp and dinner under the stars! Up at sunrise on day 3 for a morning walk. While guests are out walking, the mobile camp will be pack and moved to Camp Two, and lunch will be ready as the guests arrive late morning. Lunch is followed by a mid-day siesta, and afternoon walk. On day 4, guests explore the area on foot, returning to Camp Two. Guests are up at dawn on day 5 to continue walking further down the river. While guests are enjoying their morning walk, the camp will be moved again, to Camp Three. The next two days are spent exploring the area around camp three on foot, returning to the same camp site. After an early breakfast on day 7, guests transfer by vehicle (4 to 5 hours) to the magical Tena Tena Camp for an overnight - the perfect ending to the safari. This lovely camp only acommodates 10 guests, and is set into a shady grove of mahogany trees. The spacious tents are custom made, each with a private verandah and en suite open-air bathroom. The interiors are stylish and elegant, reminiscent of Hemingway's Africa. Oriental rugs adorn the floors and linen spreads cover the beds. 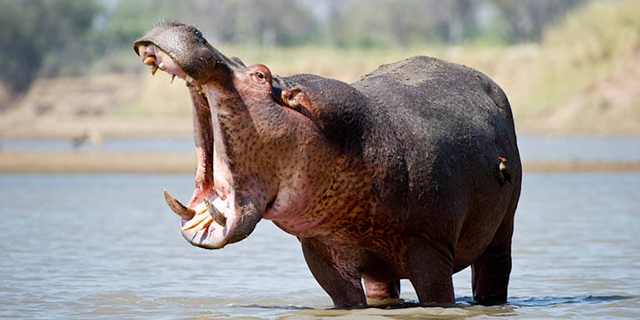 From the thatched dining room and bar, guests can watch the elephants, hippo and antelope on the river banks. From this haven, guests can enjoy day and night game-drives, guided walks, or they can simply relax. Today guests are transferred to Mfuwe airport (2 hours) for their onward arrangements. 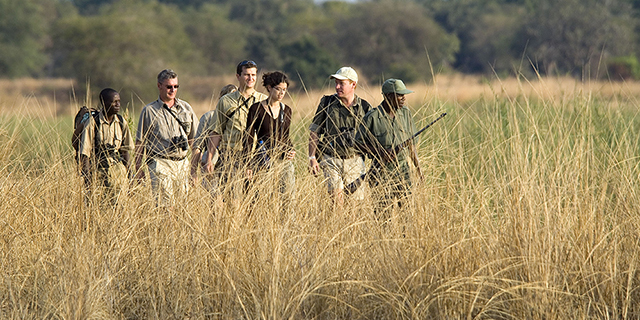 The mobile walking safaris are conducted by only the most qualified and experienced of Robin Pope 's guides, and are accompanied by armed game scouts. The fully staffed mobile camp is simple and comfortable with walk-in tents, full bedding, a shared long drop toilet and bucket shower. Camp staff take care of all chores, and move the camps from one camping site to another. Delicious meals of a high standard are served under the African sky. Big game does not occur along the Mupamadzi in the same concentrations as it does along the Luangwa River, but being on foot in such a remote wilderness area makes contact sightings of animals all the more exciting; moving slowly through the bush on foot also makes for a much deeper appreciation of the holistic nature of this vast African eco-system. All accommodation on a per person sharing permanent tented camp and camping basis; laundry; all drinks excluding premium wines and champagnes and premium spirits and liqueurs; game activities at camps and on the walking safari; transfers to/from Mfuwe Airport; services of guide and staff; park fees; the Zambia Tourism Levy. 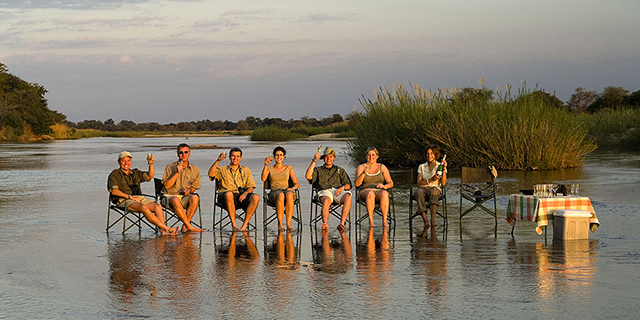 All scheduled flights and their departure taxes; all items of a personal nature; travel insurance;visas; any new Zambia taxes; gratuities to guide and camp staff and any activities and excursions which are not specified.